After months of bombing raids in London, twelve-year-old Olive Bradshaw and her little brother Cliff are evacuated to the Devon coast. Desperate to be helpful, Olive becomes his post-girl, carrying secret messages (as she likes to think of the letters) to the villagers. The first thing that catches your eye is the date on the blurb. February 1941. And then the the quote from the book: We weren't supposed to be going to the pictures that night... not when German bombs had been falling like pennies from a jar. 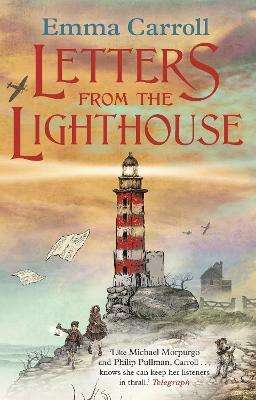 If you look at the title, it says letters from the lighthouse, and the picture shows letters flying around and two children and a cute dog below it. One is Cliff; another is his older sister Olive. Pixie is the dog. Pixie doesn't belong to Olvie and Cliff, but in the book it will tell you why they know the dog. Basically, the book drips in mystery. Did I say drip? I meant drenched. Literally, a lot of lines tend to be clues that the book explains later on, and I didn't even think of those lines at all! But the best types types of mystery books are books that have clues dotted around the book; all you have to do is piece them all together. My favourite character is Esther, who is an enemy of Olive's at first sight, but then they become best friends. Esther has such a hard life and she is still really fierce and feisty. I would totally recommend it to mystery lovers and people who like books. It's a bit boring at the start, but then the epiphany hits you full in the face and you become happy. Btw, it's a happy ending!!! I thought it was a very interesting book because it goes back in time to 1941 during the war.I enjoyed reading it because i like reading books about during the war which are diary entries because i like to know about the past and i think it is a brilliant book to read. This is my all time favourite book! Wow! I loved it! My favourite person is Queenie, because she is strong and compassionate! I would definitely recommend this book to anyone who likes mystery novels! Overall, I loved it and would definitely read it again! A bewitching story, I would have never guessed the ending! I think that you should really read this book as it is very interesting and easy to understand and get into .This book will be the one for History lovers .It is first set in war torn London but moves to the coast of Devon. I could not put this book down ,you will probably not be able to either. This is an amazing book set in the second world war. This book makes you think about how people were treated in German occupied countries. It is sad but also heart-moving. I think you should read this book because you can learn about what it was like as a child in World War 2. I enjoyed the code element and how Olive and her brother tried to crack it. This book has made me want to read more books on the war theme. One of my favorite books, I would highly recommend this book. I think you should read this book if you like/love mysteries. I soon started reading this book and from the first word I was transfixed. I think this book was amazing so I shall read more books by Emma Carroll. Do you like books set in WW2? Books about spies, mysteries, history and adventure? Then this is the book for you... Letters from the lighthouse by Emma Carroll!